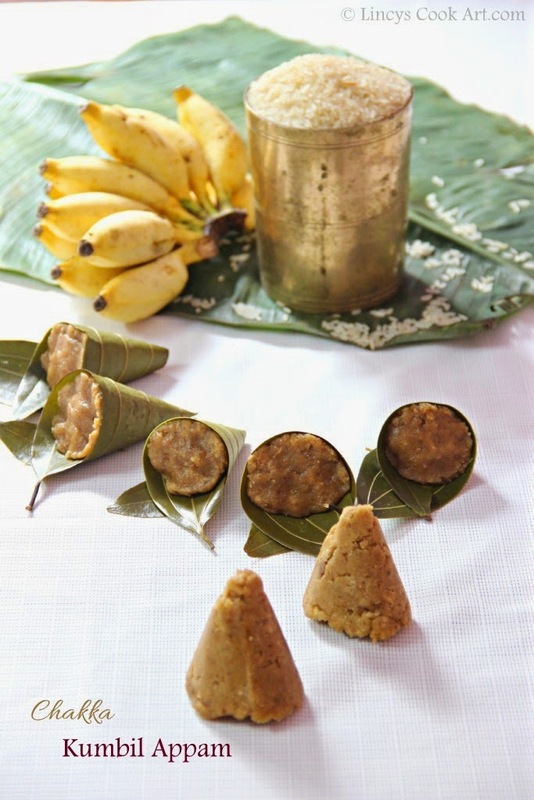 Kumbil Appam is an authentic snack item of Kerala. The name 'Kumbil Appam' of this dish is because of the shape of the Appam. Kumbu meant for the 'cone' shape of this appam. This Kumbilappam is totally flavoured by the wrap used in this appam vazhana Ila/ Therali Ila/ Indian Bay leaf. The strong smell of the leaves enter into the appam while steaming and gives a amazing flavour to this dish. We have this tree in our backyard so it is easy to prepare at any time we wish. Easy to make dish in a jiffy if you have appam podi/ roasted rice flour at your home. Purely a traditional dish with Jack fruit. You can keep this appam for 2 days if you prepare with fresh coconut. If you planned to used it more than that roast the coconut and use it for 5-6 days. In a bowl take chakka varatti and add the warm syrup over the chakka varatti and mix well to combine without any lumps. Powder the jeera and cardamom seeds. Roast the coconut till light gloden colour. (To avoid spoilage. If you are consuming on the same day rosting is not necessary). In another bowl add the rice flour, jeera and cardamom powder, dried ginger/ chukku powder and roasted coconut and mix evenly. Now add a tablespoon at a time rice flour mixture to the chakka varatti jaggery mixture and mix well. Likewise add the whole lot. Finally the mixture should not stick to your hands if you touch with fingers. If it is sticky add a tablespoon or two of roasted rice flour and mix well. Wash the Bay leaves and wipe them. Make a cone shape out of the leaves and pin it using coconut picks (Eerkil). Fill the cones with chakka mixture till top. Heat water inside Idli steamer and allow to boil. Keep the Idli base plate and spread the filled cones. Close with the lid and steam for about 15 minutes. Cooking time varies depends on the sizes of the cones. You are in mood for some Jackfruit nowadays and I love it! Looks so yummy and beautiful pics dear.. Wow!!! dear, its all new to me. but sounds yummy and delicious. I want to have this damn attractive appam..So irresistible. appam look very very tasty ..Never heard of this before..